It is with great pleasure that we announce registration has opened for the 2019 KABHE Conference, "Staying Focused During Challenging Times", hosted by KABHE-Northeast Region. 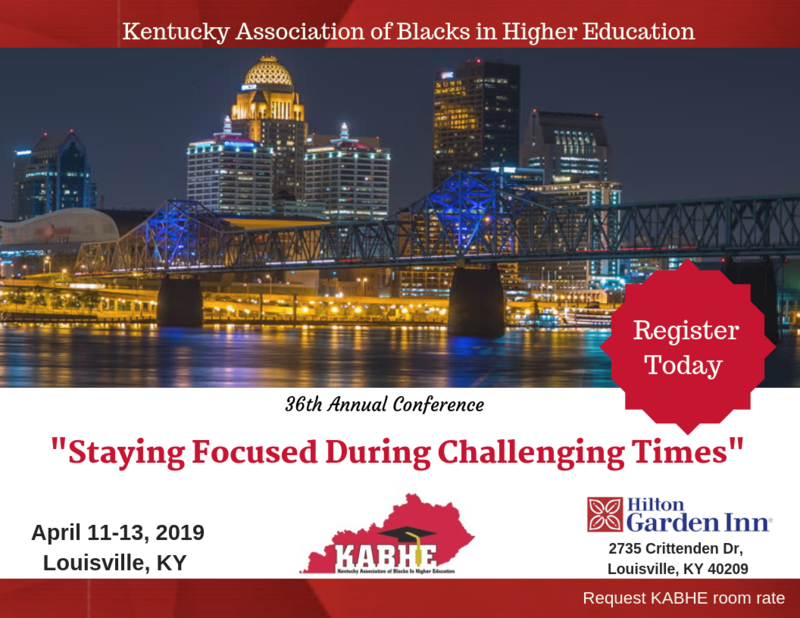 The 36th annual conference affords opportunities for all higher education administrators, faculty, staff, and students to acquire information on such topics as best practices and current trends in higher education. The conference will be held April 11-13, 2019, at the Hilton Garden Hotel Louisville Airport, Louisville, Kentucky. Informational sessions, motivational speakers, and professional networking opportunities on a variety of topics pertaining to the needs of African Americans and other underserved populations will be available. We look forward to a day of inspiration, new ideas, and building great relationships. Register early for the early bird rate which ends March 15th.